At Ad Press, we can provide all your printing needs. From prepress to press, through bindery and delivery, we can give you the quality and customer service you deserve. Our diverse mix of equipment offers our clients a multitude of production options. 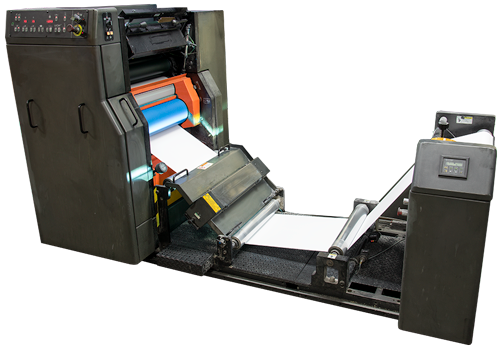 We have the advantages of high-volume Web equipment in addition to our large-format sheetfed presses. Combining this equipment with our digital imaging systems and small-format offset presses provides a solution for any printing need. We take the solution one step further by offering warehousing and fulfillment services. Using state-of-the-art technology our prepress staff will work with your supplied files to insure that they are properly formatted for compatibility with our production equipment. Digital color proofs are provided for your review on all projects. Our color proofing systems have been color corrected and calibrated to our presses so you can be assured that the proof you review will be representative of the production press run. To expedite this proofing process, we also offer online Soft Proofing. When your soft proof is ready for review, you will receive an e-mail which provides a link to our proof review Website along with an access code. By entering this code, you are linked to your proof. You can review this proof and make editing comments online. You can process your orders and review your proofs, right from your desktop. We offer a variety of methods to move your files to Ad Press, including access to our FTP site to upload your print-ready files. If you are not a current user, please contact Sales or Customer Service to obtain a user name and password. Our web presses are capable of producing the most common business forms configurations and commercial color products. With up to eight color units, using both conventional and UV inks, we produce the highest quality products available. The web cylinder sizes of 14 inch, 17 inch, and 22 inch can accommodate most standard business forms sizes for laser compatible cut-sheet and continuous letterheads, checks, multiple-part snap sets, and continuous forms along with commercial color marketing pieces. At Ad Press, we have perfected the ability to print on ultralightweight papers. These stocks are traditionally difficult to work with in a web environment, but our pressmen have mastered the technique to work with this specialty stock. This paper allows our clients to reduce the overall weight of an individual printed piece. In the case of a policy booklet or financial prospectus the difference in weight can potentially reduce the cost of postage required to mail the material to the end user. In some cases the postal savings will exceed the cost of printing! 1 – Didde Variable Cylinder 14" / 17" / 22"
2 – Didde Variable Cylinder 17" - 22"
We have five larger format sheetfed presses in operation at our Middleton plant. They range in design from a single-color up to six-color units. We can accommodate press sheets up to 28 inches x 40 inches. These presses can effectively handle stock weights of 20# bond up to 140# board in a full range of both coated and uncoated papers. Aqueous coating and varnishing in both spot and flood formats are also available. Our experienced pressmen have effectively reduced our press setup times which allows us to move quickly from one press configuration to the next. Working in conjunction with our press scheduling software, these production efficiencies make us especially competitive when pricing small to mid-range press runs. For press runs from 1,000 to 50,000 impressions and beyond, Ad Press can provide the quality that you demand for a price that you can afford! 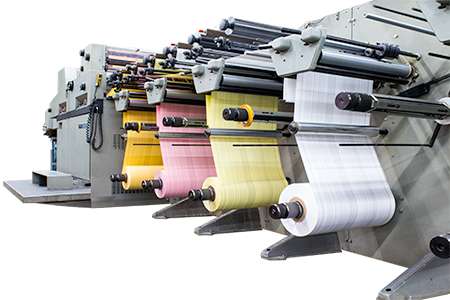 Ad Press offers a “Print on Demand” solution to accommodate low-mid volume, variable data, and quick-turn time projects. 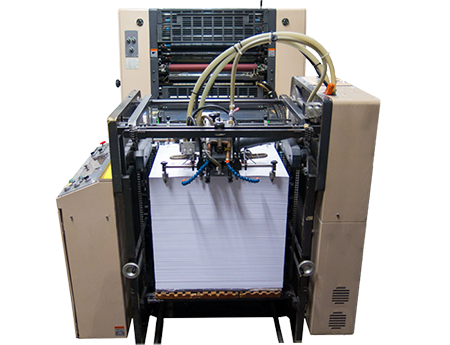 This equipment is suited for all high quality marketing materials, variable mailing pieces, directories, and manuals which would be too costly for traditional offset techniques. 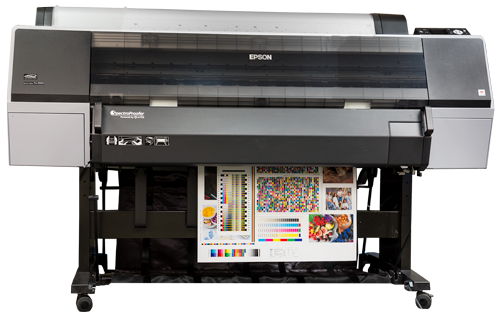 Our electronic printing department includes several black and white and several high quality color digital systems. If you would like to add some flair to your piece add one of the many coating options like protective, gloss, high gloss, matte or a raised dimensional feel. If you are looking for a secure print area for your confidential printing needs we have one that includes biometric access controls. We use these digital imaging systems to complement our web and sheetfed divisions, making Ad Press a true "One Stop Shop". Contact one of our sales representatives to discuss how this system can reduce your printing costs. A well-printed project can be ruined by a poor job of finishing in the bindery. That is why we are so focused on quality in our bindery department. Using the latest technology in working with paper products, our bindery craftspeople use the greatest care in making sure the final product exceeds the client’s expectations. From adherence to accuracy in specifications down to the packaging and labeling, the focus is all on quality. Our experienced bindery staff has even reengineered some of our finishing equipment to accommodate our specialty products, like lightweight papers. Working with multiple equipment suppliers, they have combined several pieces of equipment to work together to effectively handle paper stocks that would be problematic for most printers. Multiple Cutters up to 45"